Ask any Malaysian what's wrong with the economy, and they'll probably say it's the (endemic) corruption﻿. It's a fair enough point. But what really bugs me about this economy is the labour market. Case in point is the graph above. Output is increasing but returns aren't automatically realised by labour. Malaysia's inflexible labour market system - i.e. wages are not encouraged to track inflation. The once-a-year wage adjustment process and really stringent hiring and firing rules make it hard for wages to conform to price levels. It's definitely something that affects private investments - as wages generally dictate talent - and it's something that the Government can do about without using much resources (amend some labour law rules and make the subsidy rationalisation process more transparent <-- but more on that later). how do wages affect private investments? 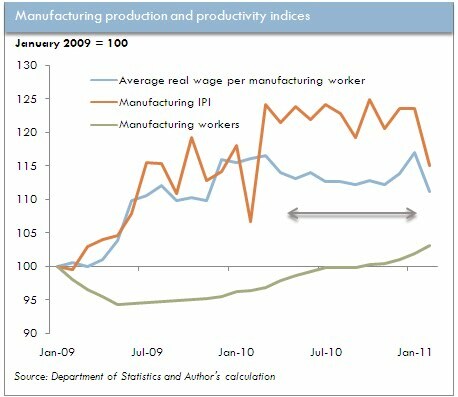 if anything, I would think that depressed wages would give firms more scope to invest? Well, it's a matter of perspective. In the short-term, firms do profit from setting depressed wages. Over the long-term however, if and when firms do start investing in capital, the required skilled labour will start to cost them. It's going to be quite hard attracting talent when your wages - which, when compared across countries, are affected by subsidies and the exchange rate regime - are depressed. but if my cost of living is low...what's the problem? The grey-ish line in the diagram is actually adjusted for inflation (measure of cost of living), so in effect the quality of consumption has stagnated for that year. A subsidized economy with an undervalued currency will give less comparative adjusted savings...which I think is an obvious turn-off for talented labour.